The Internet of Things (IoT) refers to the set of sensors, devices, and systems that interconnect via the Internet. It has found wide applications in home automation, personal healthcare monitoring, surveillance systems, smart meters, wearable devices, etc. The number and variety of devices connected as well as the amount of data they collect are growing rapidly. To ensure that they can all be integrated and performing effectively, an open, scalable, reliable and secure integration platform is required. Miotta-Platform is designed and implemented by Miotta (formally Mivatek). It has been in operation for more than four years. It is an Internet of Things (IoT) platform built to manage relationships between devices, data, people, and places. It simplifies the interconnections and accelerates the creation of compelling solutions that revolutionize how people experience their world. 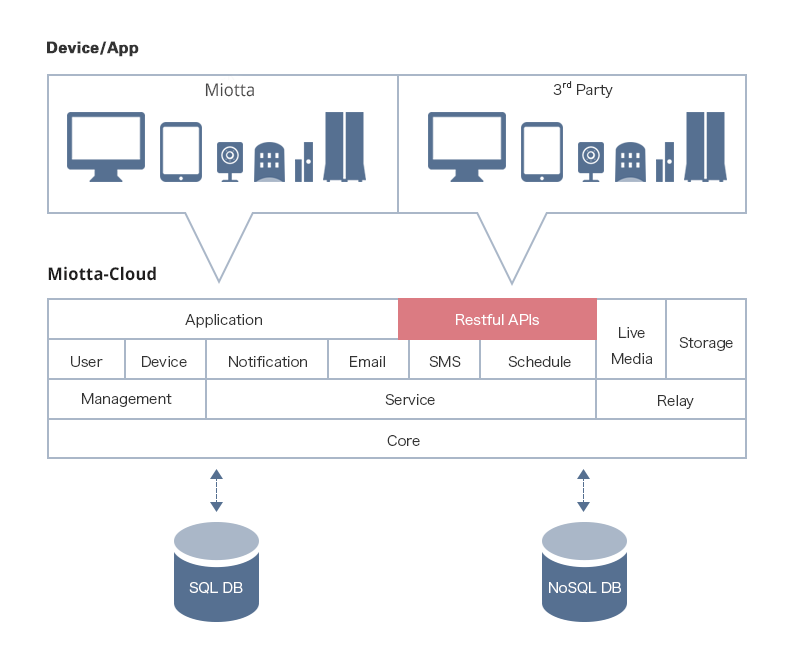 Miotta-Platform consists of Miotta-Cloud (server) and its APIs (RESTful APIs). The server establishes the relationships and manages the collaborations between devices, data, people, and places. It has the advantages of high reliability, high stability, and high capacity. Based on the platform, Miotta has built a flagship product called TripleShield, which consists of a processing unit (OPU), a couple of IP cameras, a variety of sensors and the Miotta-App. The Miotta-App can run on several mobile devices and has been released on Apple Store, Google Play, Windows Phone Store, and Amazon AppStore under the name of Miotta. Currently there are over 100,000 Miotta devices connected to our servers, and over 30,000 users registered and interacting with their devices. With the open Miotta-Platform, 3rd-party developers can gain the agility and efficiency they need to rapidly meet market demands for compelling connected products and solutions. Fine-grained access control to give the right access to the right people. Permissions to access data are always explicitly granted, and may be revoked at any time. ©2016 Miotta. ALL RIGHTS RESERVED.